The Red Snakehead Fish or Channa micropeltes is considered a dangerous and invasive species that can grow to 7 feet and 22lbs. 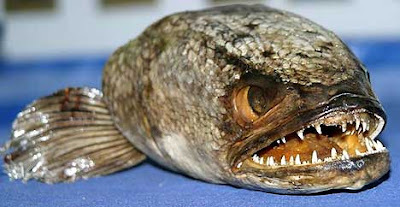 Snakeheads can even crawl on land and have the ability to survive outside water for 3 to 7 days! As the Snakehead fish grows older, they lose their stripes and turn a bluish black and white pattern on their upper body. If you see one of these things in the USA, contact the fish & wildlife authorities. Possession and release of them into the wild is illegal in the USA.